Bernie, you say that your new product “antsle” is a turn-key solution for Autonomous Web Hosting. Can you please explain what that means? Developers and other individuals are searching for a solution to the problems the cloud has brought us. The Internet’s control structures are broken. Just 50 companies control more than 80% of the servers that together make up the Internet. This kind of concentration of control is threatening – and the opposite of what the Internet was meant to be. Hosting needs to be redefined – in a way that people can host on their own servers from home and redefines the Internet a place of freedom, independence and autonomy once again. In order to solve these serious problems, we need a solution that is complete, that solves the problem rather than just providing bits and pieces that might be used to solve the problem. That’s why we designed antsle as a turn-key solution. The antsle solution begins with our innovative piece of hardware, a beautiful, completely silent, and powerful home server. Then we provide antsleOS to enable either container-based or – if needed – hardware-level virtualization to enable hundreds of virtual servers on just a single antsle machine. And finally, our antman management GUI makes creating and managing your VMs a breeze. That includes easy installation of (open source) software packages or “apps”. What are some of the challenges that developers find when using web hosting services? Today’s highly centralized Internet poses the burden of trust completely on the developers’ shoulders. They need to trust their hosting providers and the whole “food chain” that comes with it. They are forced to upload all their valuable code and data to their web hoster’s datacenter. And – let’s face it – you never know what they do with your data. Hosters are under government surveillance. They rely on advertising to make money based on your data. As a developer, I can say I just feel much better if my code and data is on an antsle in my home, and *I* decide if and when that data leaves my home. Another problem that developers face is the cost side. Each and every VM costs extra. When we want to try out that cool new server-side software package, we need another VM and – tada – it will be another $20/mo. That stifles many people’s curiosity, experimentation and finally innovation, with which we need in order to compete. In contrast, with antsle the marginal cost to create more VMs in zero, nada, nil. I understand the antsle is built for software developers. Can it be tempting for non-developers as well? Absolutely. antsle provides a number of predefined software packages. You might call them server-side “apps”, for specific purposes. Take Syncthing, for example. With Syncthing, you can replace your dropbox subscription, and have all your data in your hone under your own control. We also have additional “apps” for your private note-taking repository, your private Email, address book, and calendar storage that only leaves your home if and when YOU decide. While these apps do work well for the experienced users, we want to gain some experience and feedback in a beta phase before we actually target a broader audience. That’s why our main focus is developers right now. But experienced non-developer users are definitely welcome to check out antsle right now. What are the various components of the antsle solution? First, there is our hardware product called the antsle one. It contains a powerful Intel quad-core or octa-core (i.e. 8 core) CPU and at least two SSDs. We mirror your valuable data to the two SSDs so in case one of them fails, you can recover your data from the other. We use the ZFS file system because it is designed to never, ever produce a state where your data on the disks is corrupted, not even at a powerful situation. This is all important when you want to host from home. To further support that never-corrupt-your-disks feature, we exclusively use error-correcting RAM (ECC-RAM) in our antsles. The case is beautiful and 100% aluminum. The case itself functions as the heatsink. Even when all eight CPU cores are under 100% load, the case will become just lukewarm. There are no vent holes either, so the appearance is beautiful and there is no chance for dust to enter the antsle. Second, we have antsleOS. It’s based on Sun/Oracle’s Solaris operating system and enables two things that are important to us: ZFS in a 100% production-ready and battle-proven way (something that Linux alone cannot provide) as well as powerful and efficient virtualization by means of so-called Solaris “zones”. In that respect, anstsleOS is the key to providing highly efficient, “container-based” virtualization that enables hundreds of VMs on a single antsle. If needed, hardware-based virtualization” (through KVM) is offered as well. The latter lets you run not only Linux, but also FreeBSD or Windows in the individual VMs on your antsle. What are the coolest server-side apps for the antsle? I love redmine, an open-source collaboration tool. Some compare it to basecamp. You can surprise your friends by providing your own, issue-based collaboration tool next time you do a “project” with them, e.g. organizing an event or building a private website. Etherpad is cool as well. It lets you type collaboratively on a document, the others seeing each characters as you type. And with an antsle, what you type won’t go to any company’s server. No one sees it except for the people you approve. Syncthing is great as an alternative to Dropbox. It feels so good that your Dropbox “datacenter” is in your home, under your own control. Your antsle has lots of capacity, both regarding storage and compute power. Why not spare some of the capacity to set up your own minecraft server? Your teenage kids and their friends will be grateful forever! What is antsle’s vision? How can antsle change how people interact with the internet. The Internet’s control structures are broken. antsle’s vision to decentralize the web again, to give back freedom, power and autonomy to everyone that uses the Internet. We envision everyone to have an antsle in their home, running services on servers that they own and control, rather than paying “rent” to a few big companies that dominate the Web’s services today. You say the Internet’s control structures are broken. What do you mean by that? Just 50 companies dominate more than 80% of the servers that together make up the Internet. Today, there are about 800 million websites. And just 50 companies control most of it. 50 companies – that’s just .000007% of the total number of websites. This kind of centralization of control is not how the Internet was meant to be. It’s meant to be a place of freedom and autonomy. Are there other products or technologies that antsle is working on that you would like to talk about? To me, the most exciting new product we’re working on right now is antsle-to-antsle backup, or a2ab for short. While antsle mirrors all your data on two SSDs, that won’t help if your house burns down. For these cases, you’ll want a backup that’s located that’s geographically separate from your own. It would be against our mission to suggest you upload your data to the cloud for backup purposes. Instead, with a2ab, you can distribute your data safely to fellow antsle users for backup. In return, you reserve some space on your own anstle to back-up your fellow antsle user’s data. In order to make all that work in a safe and secure way, we have invented a few innovative technologies. Based in San Diego and launched in 2014, antsle’s mission is to preserve the advantages of cloud computing, while liberating us from its downsides. Our vision is to have antsles in every home, hosting exciting apps, augmenting and partially replacing the large-scale datacenter. A huge number of cooperating, social and hard-working antsles are challenging the dominating status of a few dinosaurs. 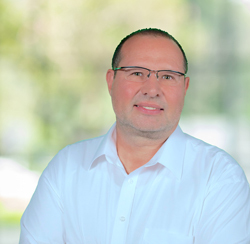 Bernd “Bernie” Blume is the CEO and one of the founders of antsle. After a corporate career at IBM and a telecoms carrier, Bernie founded software startup Xionet and raised $4M in Venture Capital prior to founding antsle.